Open showers are growing in popularity, but what exactly are they? This bathroom trend features a shower with a layout that’s free of doors or curtains. It’s a minimal and luxurious look, and that’s exactly why many people are drawn to it. Read on for a full overview of open shower designs, including how much they cost and how to determine if this style of shower is right for your home. What is an open shower? Open showers are designed to maximize bathroom space, and they often don’t include a tub, which provides more space for a large, luxury shower experience. “This experience can include space to sit, dual shower heads, rain showers, and ample space for more than one person,” says Leigh Spicher, national director of design studios for Ashton Woods. Now that you know what an open shower is, how do you know if it’s right for your home? For one, an open shower will make your bathroom feel, well, open. “This spa-inspired design instantly creates the sense of more space by removing walls, using the same flooring throughout, and letting light flow more freely throughout the space,” says Eric Moore, an interior designer at Kohler. But that isn’t the only advantage of an open shower. Moore says its design makes it ideal for aging in place. An open shower design also eliminates the need for a shower curtain. “The area is much easier to maintain over time and reduces the mold factor in your home,” says Spicher. Kelly Parks, broker and owner at Paris Gibson Realty in Great Falls, MT, says open showers are great for resale value if you decide to move in the future. The upsides of an open shower may make it seem like the ideal bathroom setup, but it also comes with a handful of shortcomings. Also, an open shower will mean you’re fully exposed in the bathroom. For some, this isn’t a problem. But others may enjoy the comfort of a private shower. 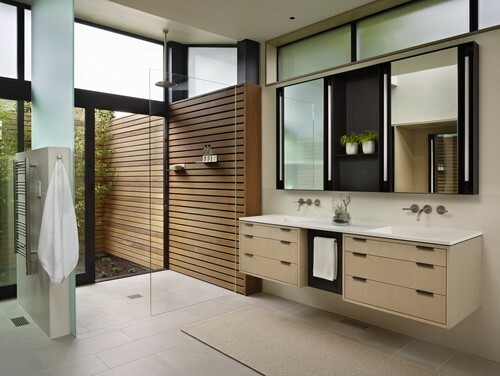 “Some people prefer the privacy of enclosed showers, especially when more than one person may be using the bathroom at a time,” says James McDonald, senior designer at OBMI International, an architectural firm in Coral Gables, FL. Dan DiClerico, a home expert at Home Advisor, says one of the biggest downside to this design trend is that it usually increases the cost of a bathroom renovation. “The average cost of a full bathroom remodel is just under $10,000, but a reno with an open shower is going to be closer to the higher end of the scale, around $20,000,” DiClerico says. Why is the price tag higher for a bathroom with an open shower? DiClerico says the overall quality of the work needs to be extremely high to make sure every inch of the room is watertight. “For example, the slope of the floor must be just right or you’ll end up with standing water in one corner of the room,” he says. If you’re leaning toward building an open shower but don’t want to spend all of your budget on it, there are some other options that won’t break the bank. DiClerico notes that you can save money on materials. “By choosing inexpensive ceramic tile and a single shower head, you might be able to have an open shower installed for as little as $2,000,” he says. However, he warns against cutting corners on labor. “If your contractor doesn’t know what he or she is doing, you’ll end up spending many thousands more on repairs from water damage,” he cautions.